Even if advanced research results in more advanced medication for diabetes, the best treatment for diabetes would always be walking. After digestion, all the food that we eat is converted to glucose, which is sent to the blood stream and used for different functions in the body. If you eat a meal of 500 calories, your body utilizes about 350 calories of this for its daily metabolic activities. The extra 150 calories has to be utilized for other functions or it gets circulated as glucose in the blood stream. Normally, insulin is required to mobilize this extra sugar into fat for storage in fat cells or any other product in the body. However, in a diabetic, this function is altered and hence, the removal of glucose from the blood stream does not take place normally. This results in consistently high blood sugar levels in diabetics. Walking helps improve the functioning of all the glands and hormones in the body. This cannot be done more effectively than any other exercise. For this extra glucose in the blood to be metabolized into different products in the body, no medication can help do it except walking for 30 to 40 minutes. Walk stimulates the release of insulin which will help reduce the glucose from the blood stream. If you have already been walking, continue to do so. If you are not regular, make it a point that you walk for at least 45 minutes a day. If you are planning to start walking, start with at least 20 min and gradually increase the duration to 45 minutes to 1 hour. 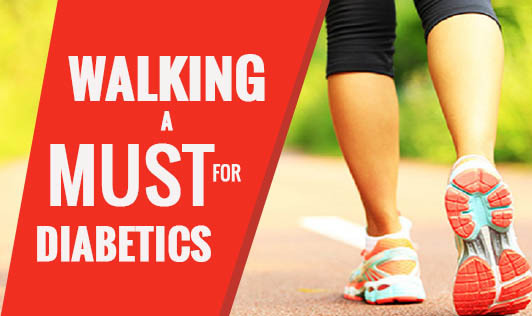 Just like how medications need to be taken every day, dedicate an hour towards walking everyday to maintain your blood sugar level efficiently.